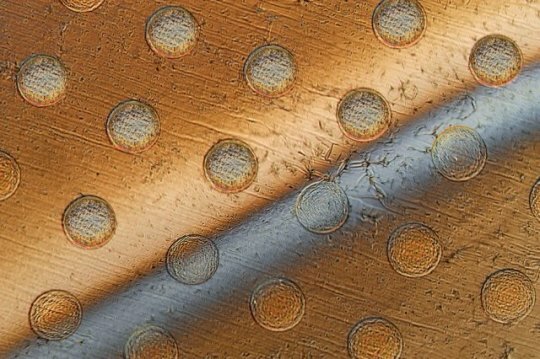 Researchers have discovered a way to mass produce tiny, cell-sized robots that could be used for industrial or biomedical monitoring. Tiny robots no bigger than a cell could be mass-produced using a new method developed by researchers at MIT. The microscopic devices, which the team calls "syncells" (short for synthetic cells), might eventually be used to monitor conditions inside an oil or gas pipeline, or to search out disease while floating through the bloodstream. The key to making such tiny devices in large quantities lies in a method the team developed for controlling the natural fracturing process of atomically-thin, brittle materials, directing the fracture lines so that they produce miniscule pockets of a predictable size and shape. Embedded inside these pockets are electronic circuits and materials that can collect, record, and output data. The novel process, called "autoperforation," is described in a paper published today in the journal Nature Materials, by MIT Professor Michael Strano, postdoc Pingwei Liu, graduate student Albert Liu, and eight others at MIT. The system uses a two-dimensional form of carbon called graphene, which forms the outer structure of the tiny syncells. One layer of the material is laid down on a surface, then tiny dots of a polymer material, containing the electronics for the devices, are deposited by a sophisticated laboratory version of an inkjet printer. Then, a second layer of graphene is laid on top. People think of graphene, an ultrathin but extremely strong material, as being "floppy," but it is actually brittle, Strano explains. But rather than considering that brittleness a problem, the team figured out that it could be used to their advantage. "We discovered that you can use the brittleness," says Strano, who is the Carbon P. Dubbs Professor of Chemical Engineering at MIT. "It's counterintuitive. Before this work, if you told me you could fracture a material to control its shape at the nanoscale, I would have been incredulous." But the new system does just that. It controls the fracturing process so that rather than generating random shards of material, like the remains of a broken window, it produces pieces of uniform shape and size. "What we discovered is that you can impose a strain field to cause the fracture to be guided, and you can use that for controlled fabrication," Strano says. When the top layer of graphene is placed over the array of polymer dots, which form round pillar shapes, the places where the graphene drapes over the round edges of the pillars form lines of high strain in the material. As Albert Liu describes it, "imagine a tablecloth falling slowly down onto the surface of a circular table. One can very easily visualize the developing circular strain toward the table edges, and that's very much analogous to what happens when a flat sheet of graphene folds around these printed polymer pillars." As a result, the fractures are concentrated right along those boundaries, Strano says. "And then something pretty amazing happens: The graphene will completely fracture, but the fracture will be guided around the periphery of the pillar." The result is a neat, round piece of graphene that looks as if it had been cleanly cut out by a microscopic hole punch. Because there are two layers of graphene, above and below the polymer pillars, the two resulting disks adhere at their edges to form something like a tiny pita bread pocket, with the polymer sealed inside. "And the advantage here is that this is essentially a single step," in contrast to many complex clean-room steps needed by other processes to try to make microscopic robotic devices, Strano says. The researchers have also shown that other two-dimensional materials in addition to graphene, such as molybdenum disulfide and hexagonal boronitride, work just as well.